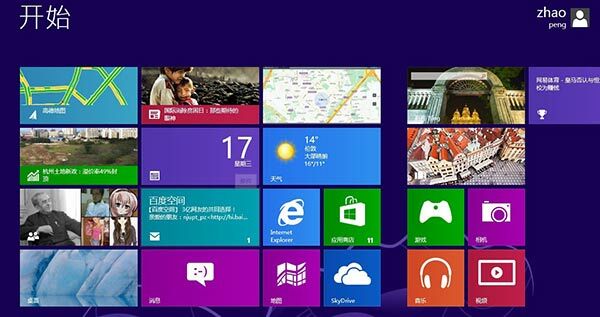 Microsoft was surprised when the Chinese government announced that it is officially banning all government use of its latest operating system, Windows 8.X. This comes as a blow to the technology giant which is already struggling with sales of its newest OS. 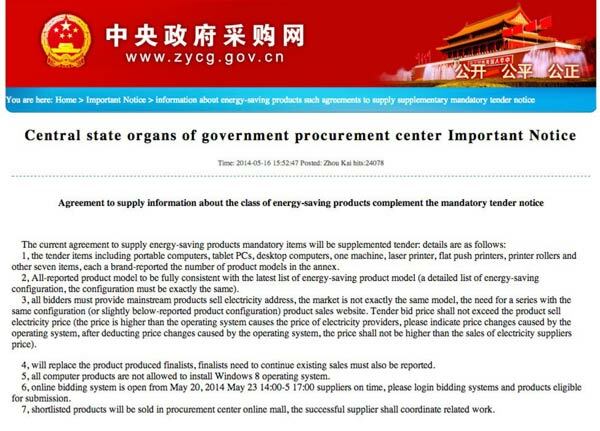 According to a statement released by the Central Government Procurement Centre, posted last week, the ban was issued as part of a notice on the use of energy-saving products, forbidding new government computers to have Windows 8 installed. The official Xinhua news agency, one of the Chinese government's media representatives, reported that the ban was issued to ensure computer security on government computers after Microsoft ended support for its Windows XP OS, which is very popular in China. "The Chinese government obviously cannot ignore the risks of running OS without guaranteed technical support," Xinhua reported, according to the BBC. "It has moved to avoid the awkwardness of being confronted with a similar situation again in future if it continues to purchase computers with foreign OS." Though Microsoft has ended support for Windows XP, the company is still offering extended support to enterprise customers, such as the UK and Netherlands government. Both governments have signed multi-million dollar contracts for Microsoft to continue to provide support for remaining XP computers. Also we heard some previous confirmation from Microsoft that several Chinese internet firms would work with it to provide some support to the aging OS in China. Obviously that move wasn't considered to be good enough. The Xinhua news agency reported that the ban could prove to be an opportunity for local Linux-based alternatives, such as Kylin and StartOS. But neither Xinhua nor the government detailed how the ban could ensure security or supported the use of energy-saving products, Reuters found. A Microsoft spokesperson said that the company was "surprised to learn about the reference to Windows 8 in this notice." "Microsoft has been working proactively with the Central Government Procurement Centre and other government agencies through the evaluation process to ensure that our products and services meet all government procurement requirements. "We have been and will continue to provide Windows 7 to government customers. At the same time we are working on the Window 8 evaluation with relevant government agencies," Microsoft said. It's difficult for Microsoft to handle China, as despite the country's huge population it reportedly generates less revenue for the company coffers than the Netherlands. This is said to be due to the rate of piracy. Meanwhile it is thought that Windows XP is still running on about half of all desktop computers in China – so there's a big opportunity if people can be persuaded to upgrade and pay for the new operating system. XP Support ended almost 13 years after release….and because MS won't support a 13 year old piece of software, they ban the newest release? Me thinks there is a hidden agenda! Linux would only be a consideration if they consider the support to be equal or superior to MS's windows support. Establishing that with a western company is going to be tricky - Red Hat's end of life support isn't that far removed from MS's for example. It's simply not feasible for western companies to provide support for life on a cheap product, but a Chinese local/govt company may be able to. No surprises there, considering how bad Windows 8 is. So you think that people shouldn't be able to judge the quality of a product by themselves, and just have their government deciding if they can by something or not? They haven't banned it outright just banned it being used on government PC's/networks.